The Beauty of Life: What Did You Do For Breakfast? 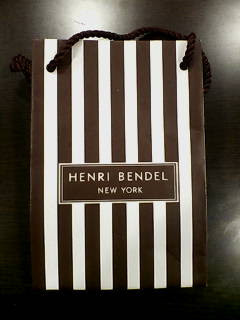 I Went to Henri Bendel. What Did You Do For Breakfast? I Went to Henri Bendel. There is only one event that could make this beauty chick drag herself out of bed while it's still dark outside, interrupting her beauty sleep and making her groggy for the rest of the day. And that event is none other than the Henri Bendel Beauty Breakfast. Bendel's -- famous for those oh-so-cute brown-and-white shopping bags you see all over Fifth Avenue every day -- opens up its doors twice a year to the lucky beauty industry insiders who happen to get an invitation. I've been dying for an invitation for years ... and finally, finally this year I got one! Stepping through the doors was like stepping into heaven. Before me lay tables and tables full of products by fantastic brands like Laura Mercier, Ted Gibson, Kai and Mally Beauty, in addition to gorgeous new lines such as Isabela Capeto and Beauty Rehab. Walking from table to table left me breathless and in awe of how many new products there are to test out! But my favorite part of the event was getting to finally meet some of my fellow beauty bloggers. All in all, it was such a fantastic experience -- and I definitely have products to tell all of you about in future posts! ok I seriously need to move to NY! can't wait to hear about your beauty write-ups!